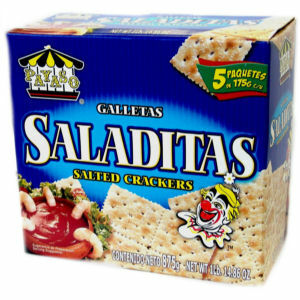 Payaso Saladitas Crackers are made using a wonderful traditional recipe. Their delicate, delicious flavor is perfect for appetizers, snacks or can be eaten alone. We add just the right amount of salt for a most delicious treat! Use for snacks, appetizers (the possibilities are endless), parties, lunch boxes, picnics, anything. Once you try them, you will agree that Payaso quality and flavor are the best! Enjoy!